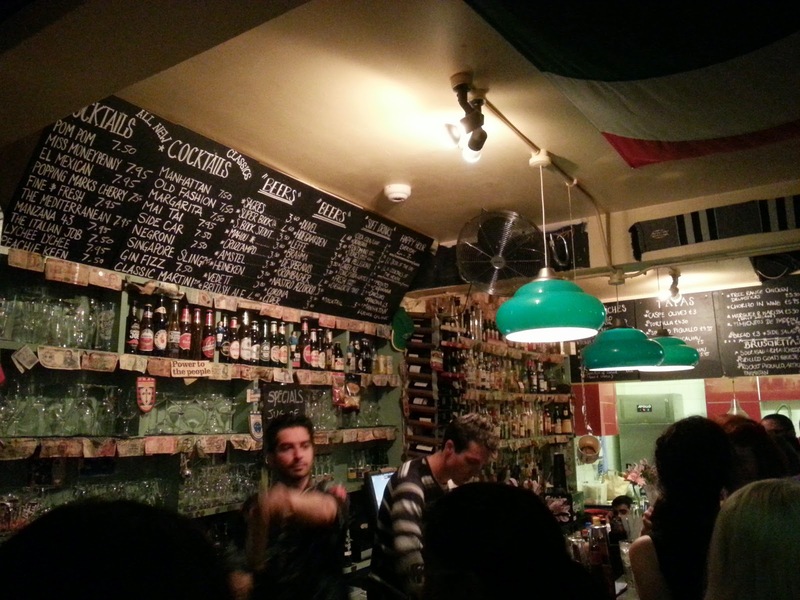 Friday 17th May - Another night in Farringdon and Clerkenwell started out with a return trip to Lazybones with my sister Jo, her fiancée Ant and Team List regular Harriet. 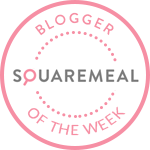 I couldn't resist the slow-cooked pulled pork again, it is really something special. Anyway, you can read more about Lazybones here. We quickly moved off to find Kitchen Party Popup in Clerkenwell - a mix of popup dining experiences tied together by the central Fourth Wall bar, all curated by Bourne and Hollingsworth. 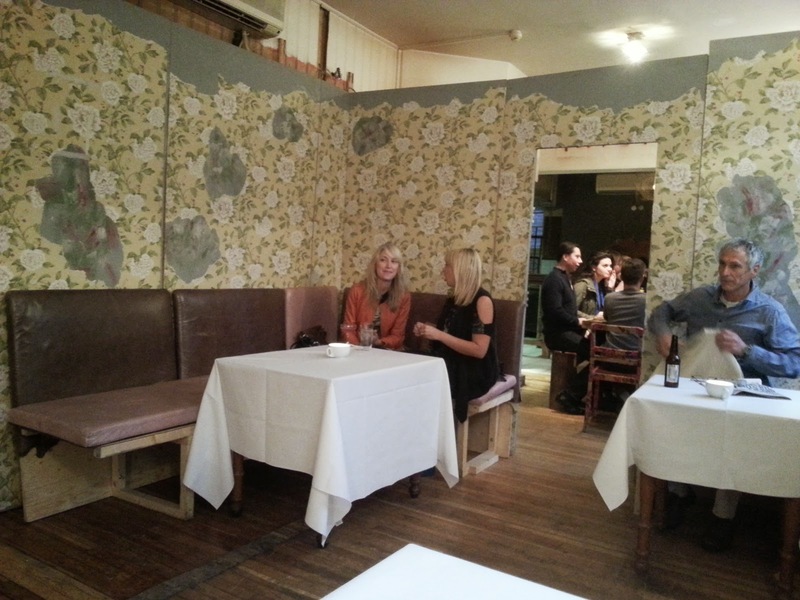 They have brought over the same "Grandma's living room" wallpaper from their Goodge Street bar and a few of the cocktails. 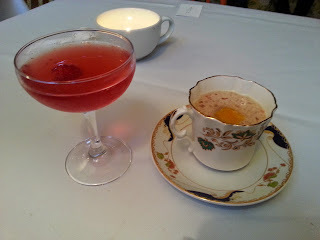 The Lychee Martini and Chimps Tea (in a teacup) were the most enjoyable of the ones we tried. 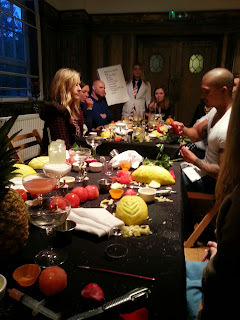 At 7.30 we were called in for Extreme Garnishing workshop (which we booked in advance - £15 each) by our hosts for the evening, Brandy & Robin (of The Robin Collective - Bompas and Parr proteges who put on bizarre food and drink events). 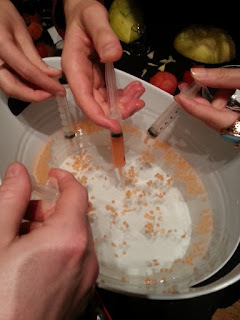 We weren't quite sure what to expect from the description on the website, and when we entered the room we found our places laid with syringes, knives and a mysterious looking pill. Thankfully, Brandy and Robin were an amusing double act who quickly took away the fear with the use of a silly flip chart, although they also warned us about the finale which involved Class 3 explosives. 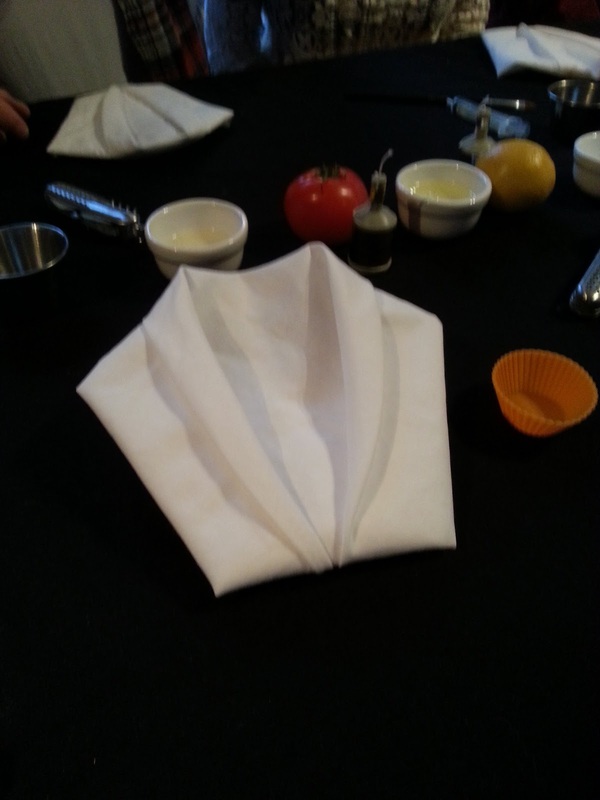 We started off slow, making a dinner jacket out of a napkin (Jo's collar was singled out!) and a rose out of a tomato before blindly swallowing our mysterious pill. 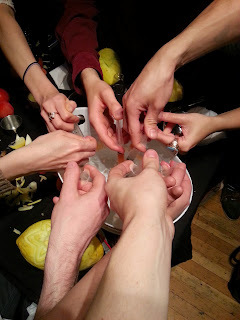 This turned out to be a pill for turning off your sour receptors, which we proved by eating some slices of lemon and drinking vinegar. 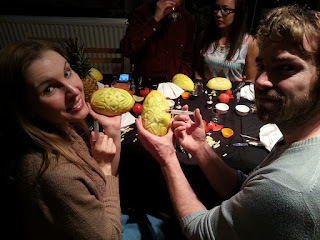 Then we did some creative melon carving before using our syringes to make some cocktail caviar - all clever stuff, send The Robin Collective a message if you want any of it explained. 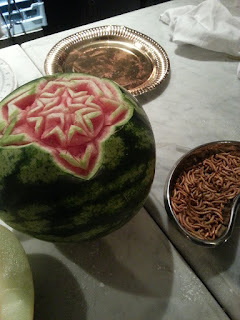 I won't go into too much detail or you won't need to go yourselves! One of my favourite parts was the use of party poppers. We took out the coloured paper filling, leaving just the explosive, and filled it back up again with parsley before firing them at mashed potato! 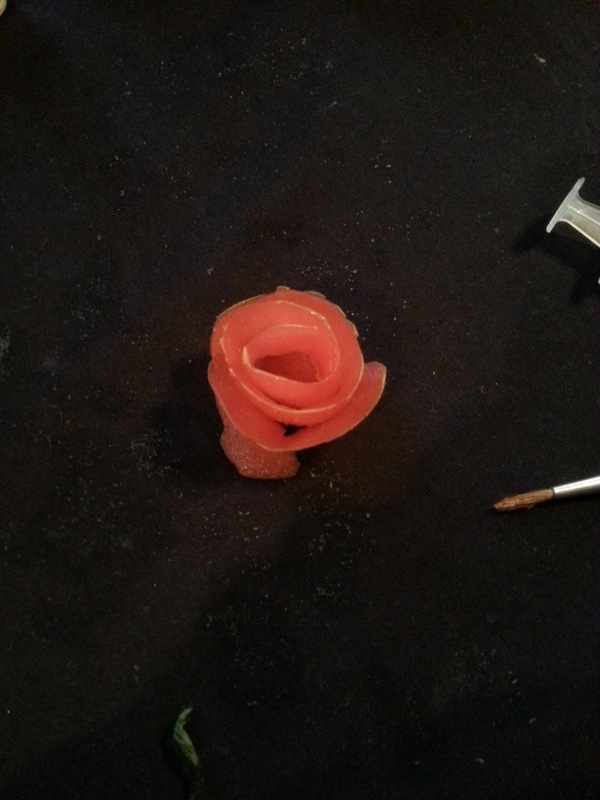 No doubt you could use various other fillings for some easy to replicate Extreme Garnishing. The two big final events were carried out by Brandy and Robin without our help - probably wise. 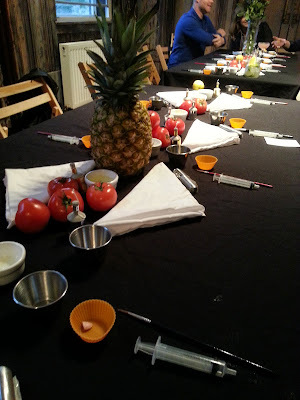 First up, they adapted icing sugar to make it extremely flammable and put some in the top of the pineapple - see the video below. They have previously covered a wheel of cheese in it at a wedding for a groom who hated wedding cake, allowing him to initially conceal the fact that it wasn't a real cake, before dramatically burning away the icing to reveal the cheese. Finally, they attempted to stuff a chicken by firing a rocket with a stuffing-laden spade attached into its rear. 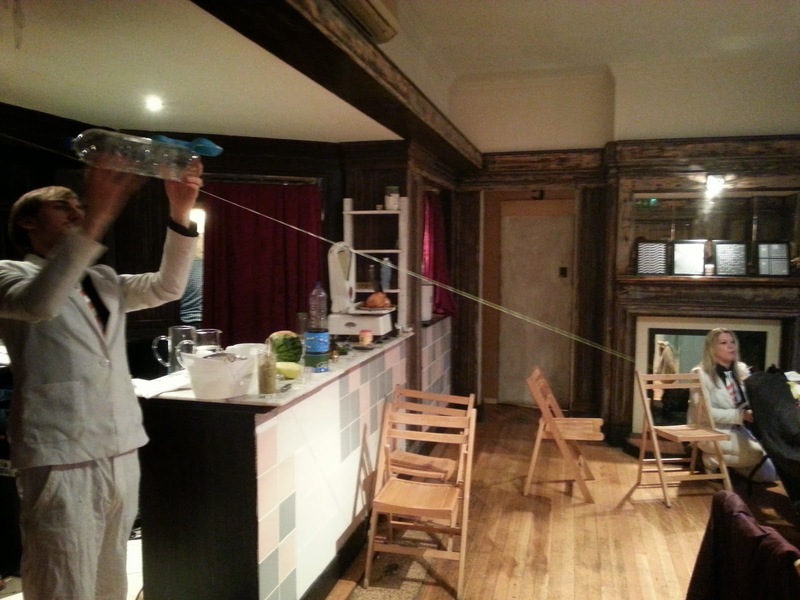 This involved setting up a string track for the rocket aimed at the chicken's bum, and lighting a highly explosive substance (all available from Amazon!) in the bottle. It sadly just missed, but it was great, shambolic entertainment! Just as we were leaving, they also gave us a taste of one of their Historical Bitters. 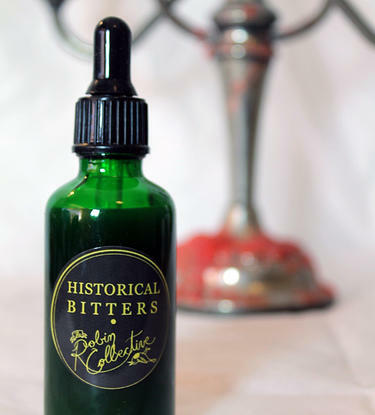 They extract the essence from walls of famous buildings and add it to various spices to make a bottle of alcoholic bitters. 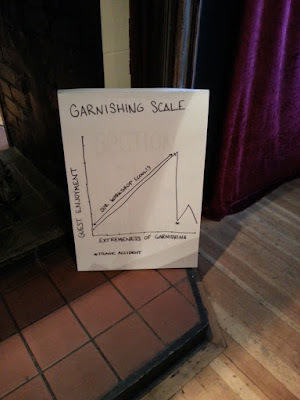 We tried a bit of Arthur Conan Doyle, who apparently tastes of cloves. Robin has made a bottle from the burial chamber of the elephant man. Brandy has Winston Churchill in her freezer. Keep an eye out for other new events from The Robin Collective - past events show that they an inventive and ambitious team. Kitchen Party Popup has three other events at the moment worth checking out - 1. Rack and Ruin (£25 a head) - hearty 3 course mediaeval banquet served straight from the fire to your plates. 2. 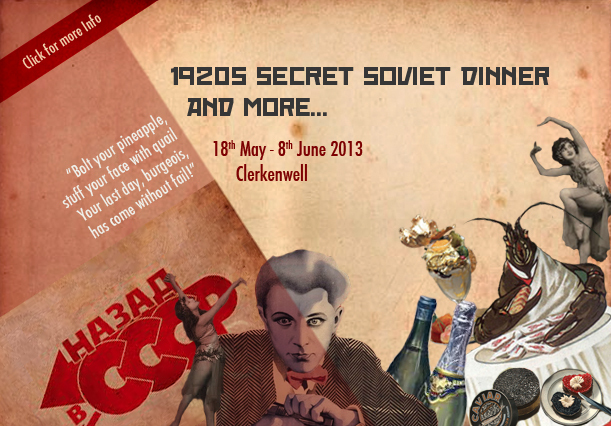 Russian Revels (£45 a head) - a theatrical dining experience with a 1920s Secret Soviet Dinner. 3. Blanch and Shock (£35 a head) - experimental food designers serving up a four course tasting menu. 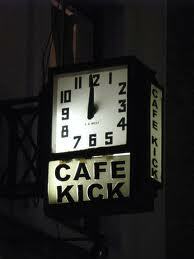 The current installations will be there for four to six weeks, when they will introduce some new experiences. Catch them before they disappear! 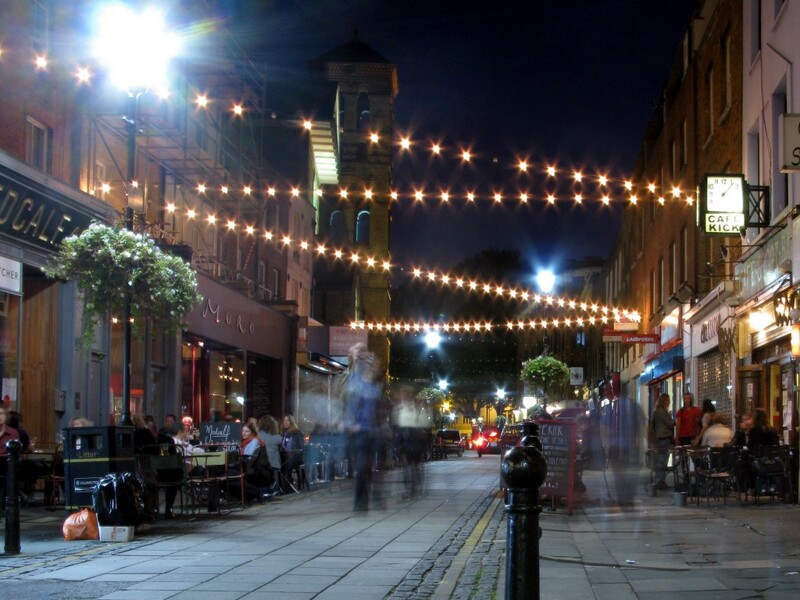 We ended our night with drinks in Exmouth Market. I must confess it was my first visit to this buzzing pedestrianised street, but it certainly won't be my last. 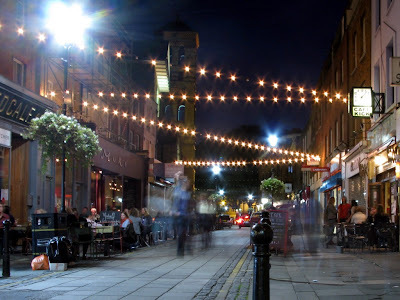 It felt like a summer night in a European city with people spilling out onto the streets, even though it really wasn't that warm. Moro and Morito, which I have heard good things about, were both packed. We also passed by the Exmouth Arms who have 5cc Cocktail Club hidden away somewhere (Team List have already been to the Shoreditch one so we didn't go in). 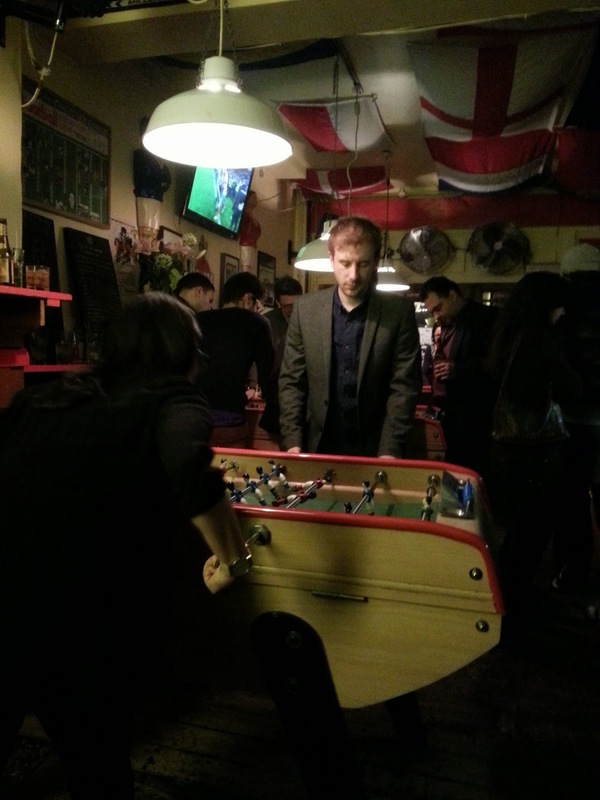 We instead set our sights on Café Kick, a classic Continental bar/café specialising in table football that opened all the way back in 1997. They also own Bar Kick in Shoreditch - read London Foodie's review full of excellent photos here. 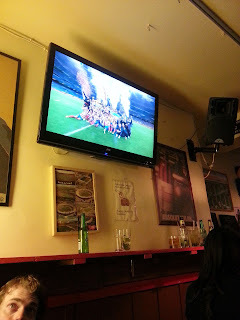 The walls are covered in flags and football memorabilia and the bar shelves are packed with all kinds of bottles. The atmosphere inside is fantastic - I could happily spend a whole day here drinking Duvel, playing cards, watching football, playing babyfoot and munching my way through their yummy bar food. Jo ordered us some fishcakes and merguez sausages with various homemade sauces which were both delicious. The chef popped out to pick up the plates and was delighted to chat about his food - he varies the side sauces depending on his mood! There was a good crowd in to watch Athletico beat Real for the first time in 14 years which added to the fun. 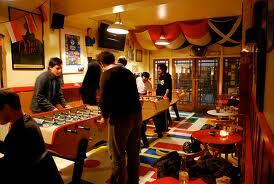 We eventually dragged ourselves away from food and a cosy table to get involved with some table football. It's very affordable (compared to hiring a table tennis table at Bounce for example!) at £1 a game - just put your money down and wait for your turn. Don't be afraid of locals hogging tables, they are very friendly! Jo turned out to be a terrifying striker, which caught Harriet and I by surprise in the first game. Once we realised that she was just wildly swinging at everything, the tables turned and we won a hard fought victory the second time around. I did however lose to the Duvel hangover which gets me every time - damn that tasty 9% beer. Sister Jo makes up some List points ground on Sister Em, and fiancée Ant starts to catch up with boyfriend Al, although a Hoxton/Haggerston trip with Em and Al looks likely this Friday. Harriet picks up a few more valuable points as she tries to set a hard score to beat before moving to Vienna.